Taylor vs Tyler, it has been nearly two years since that initial debate was settled with Lowe picking Taylor as his number 1 pick in 2010. Was it the right choice? Certainly time will tell on that one, but I think that most people were willing to agree at this point last year Taylor was the supreme player between the two. However, Tyler did show some great flashes during the playoffs including a stellar game in round three of the playoffs where he had 2 goals and 2 assists. 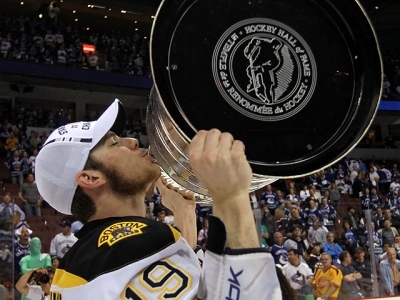 The Bruins of course went on to win the Cup and Tyler would win his first Cup before Taylor would even make the playoffs. So who was the better pick after the first year? Taylor was statistically stronger and could have even been a Calder trophy winner if it wasn’t for the late season injury which occurred in a fight with Derek Dorsett of the Blue Jackets. Fast forward to this season and statistically they are pretty equal, Tyler has 22 goals and Taylor has 23. Tyler has 52 points and Taylor has 49. Both are playing with talented players and both are really playing well. I think it really boils down to who is your kind of player? They both are young and ooze potential and they both can be superstars in the league. I think that if you ignore Tyler’s slow start, they have been have been pretty similar and really Edmonton and Boston couldn’t have gone too wrong with either player. I referenced the Guy vs Marcel debate a while back when I tracked down both of their autographs and I think that in the end, these two kids could be a pretty similar comparison. Not in the respects that I think they will be as good as Lafleur and Dionne, but rather they could be both very good number 1 picks from the same draft year. Tell me what you think! I have a couple rookies of Tyler, but the one I have pictured is probably his most valuable and isn’t one of the ones I own. 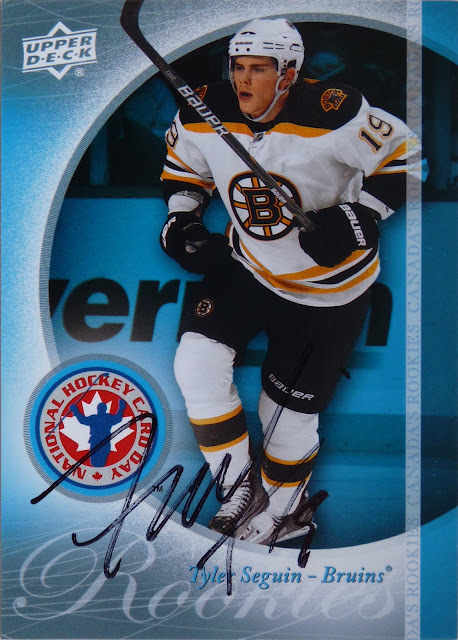 This version is from the 10/11 The Cup set, and the owner of this card wants almost 3000 for it on eBay. 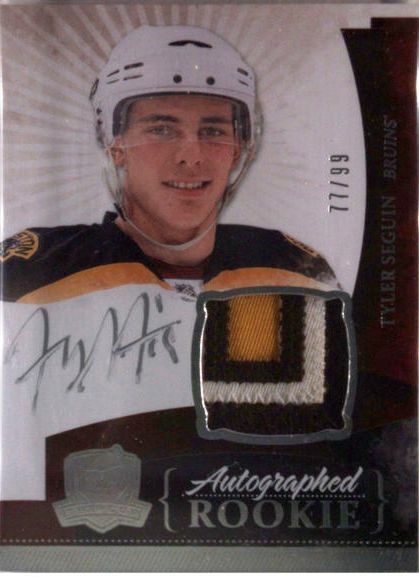 The book value on the card is about 1200 bucks which is a fair bit less than the asking price, but the patch from his jersey is pretty cool which sometimes increases the value of the card. The card I mailed away is from the same year, but it is the National Hockey Card Day version of his rookie. These cards were given away free by Upper Deck in packs at participating dealerships. The value of this card is only a couple of bucks, but I wanted an auto on a rookie card of his and it was the most affordable one I owned that I was willing to risk losing. The auto is even cooler in person and I hope Taylor takes the time to sign a card I sent him as well as the two together would make a great pair! I like Taylor better, but that's probably because Tyler is a Bruin. The Taylor/Tyler debate will go on for years until they both retire. It's great for hockey and right now it just to hard to tell who is better. 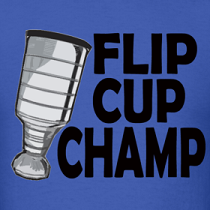 Jeff Skinner all the way. I mean he is the one that actually won the Calder Trophy not Hall or Seguin. Ovi vs. Ovechkin is still the best debate between 2 1st overall draft picks. But my only debate is that was Phill Kessel worth the trade of a 1st round pick ? even though the Maple Leafs did not know it was going to be a 2nd overall pick.